On Saturday, October 21, 2017, the Museum of Contemporary Art Chicago officially activated its new multi-purpose learning environment, the Commons, a dynamic and flexible public space at the heart of the museum. The space allows for experimentation and risk-taking, fostering a greater sense of empathy, openness, curiosity, and citizenship. Designed by Mexico City-based team Pedro y Juana, the Commons is part of the museum’s $16-million redesign, which also includes a new restaurant and street-level lounge revealed earlier this year. The programming of the Commons debuts with a site-specific, interactive project Open 24 Hours, by local artist and activist Edra Soto, that prompts visitors to consider civic engagement through writing stations, performances, and artist-led workshops throughout the run of the exhibition. Open 24 Hours is open during regular museum hours from October 21, 2017 to February 25, 2018 and is organized by Curator of Public Programs January Parkos Arnall. The Commons is both a physical space and an ongoing program, bringing together artists, thinkers, and audiences in a constellation of art projects, conversations, performances, interactions, workshops, presentations, and readings that explore culture and contemporary life. It is a place to experience socially-engaged and audience-focused practices, and an invitation for our visitors to participate in projects led by Chicago artists. The launch of the Commons also signals the start of a new engagement and partnership program. Civic and cultural organizations who make up the rich and diverse cultural communities throughout Chicago will be offered opportunities to be short and long-term participants in the work of the museum. Pedro y Juana, a Mexico City-based architecture and design studio founded by Ana Paula Ruiz Galindo and Mecky Reuss and commissioned for the project, proudly reveal a dynamic interior space with a site-specific installation comprised of hanging lights and planters. Additionally, multi-functional furniture creates an oasis inside the museum for activation and reflection. 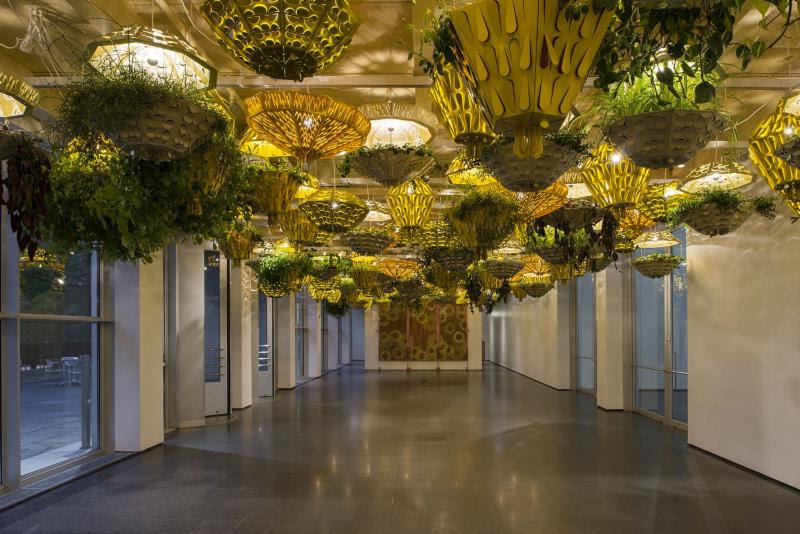 Pedro y Juana are best known in Chicago for Dear Randolph (2015), their distinct interior environment at the Chicago Cultural Center that featured a network of movable lamps, rocking chairs, tables, and a wall tapestry for the 2015 Chicago Architecture Biennial. Other recent projects have included Anastasia (2016), a courtyard installation of lanterns for the Hammer Museum’s Gala in the Garden; the exhibition display for The Natural Order of Things (2016) at the Jumex museum DF/Mexico; and Hotel Palenque Is Not in Yucatan (2014), in which Pedro y Juana worked in collaboration with Montserrat Albores Gleason to produce an exhibition and architectural intervention that was the site of Little Pig Session (Sesiones Puerquito 2012-15) during which they had a roast to prompt a social and conversational experience among attendees. Artist Edra Soto is the first of the series of biannual artistic commissions for the Commons. Her project, Open 24 Hours, considers open urban spaces, such as the Commons, as areas for both public and private moments to gather and exchange. Through interactive performances, talks, and workshops programmed in collaboration with Chicago’s creative community, Soto asks visitors to consider personal responsibility in civic spaces and invites them to explore the possibilities for socially engaged work in their own communities. Open 24 Hours is inspired by the liquor bottles Soto collects on morning dog walks in her neighborhood of Garfield Park. Soto highlights discard culture by presenting these bottles in display cases throughout the Commons, reflecting her interest in countering the littering epidemic as well as her fascination about the use of public spaces after hours. By scrubbing the bottles of identifying commercial labels, the bottles become art materials that are used in interactive workshops with visitors during scheduled activations. An ongoing interactive project, Open Forum, is a writing station in the Commons that encourages visitors to submit written ‘donations’ in response to prompts on the nature of urban space and cross-cultural dynamics. The responses are then incorporated into a series of talks, performances, and workshops presented on select Friday evenings. Edra Soto is a Chicago-based artist born in Puerto Rico. She is an educator and a curator, and the co-director of the outdoor project space the Franklin. Soto obtained her MFA at the School of the Art Institute of Chicago in 2000, and attended the Skowhegan School of Painting and Sculpture, Beta-Local in Puerto Rico, and the Robert Rauschenberg Residency Program in Captiva, Florida, though a 3Arts Foundation Fellowship. Her work has been featured at the 4th Poly/Graphic Triennial of San Juan and the Caribbean in Puerto Rico, Cuchifritos Gallery + Project Space as well as the Hunter East Harlem Gallery, in New York. She co-curated the exhibition Present Standard at the Chicago Cultural Center She was awarded the Efroymson Contemporary Arts Fellowship, and her work has been exhibited nationally and internationally. Sadie Woods examines celebrated voices in pop culture and highlights the aspirations and struggles of cultural experiences encoded in music. Woods deejays a set of anthems and mantras with socio-political meanings and calls to resistance. Damon Locks investigates music as an outlet for African Americans to express frustration, sadness, joy, love, hate, and creativity. Locks presents a music essay on race in America by way of a two-hour deejay set of music that spans genres, proposing records as oral history books. The co-stars of Worldplay, including Alberto Aguilar, Alex Bradley Cohen, and Jesse Malmed, host an audience-engaged variety show that addresses the various themes brought up in Edra Soto’s Open 24 Hours. Guest performances by Christopher Santiago, Jessica Campbell, Danielle Rosen, Erin Hayden, and Alejandro Jimenez Flores. Edra Soto discusses Open 24 Hours with curator January Parkos Arnall. Following the talk, artist Felicia Holman presents “Wassup w/that ‘YAC?! '”-an original performance centered on the perspective of a Black Gen X cis-female cognac consumer unpacking the connection between African-American culture and cognac cited in Soto’s project. A presentation of Puerto Rican bomba music that originates in the musical tradition of African, Spanish, and Taino cultures paired with metal music largely popular in the 1960s and 70s. This performance explores the nature of cross-cultural influences. Mykele Deville and Jeffrey Michael Austin produce spoken word and musical performances using content and testimonials gathered from audience participants in Open 24 Hours. These works consider the public’s shared thoughts and concerns around topics of community.